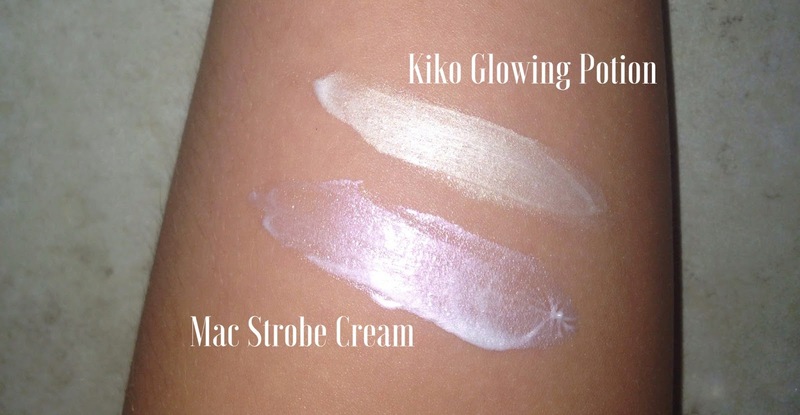 This Kiko Perfecting Serum is such a good dupe for Mac's Strobe Cream and it's half the price. So spend or save? Mac's Strobe Cream is a huge favourite of a lot of beauty bloggers so I decided to jump on the wagon and try it out and I must say I wasn't disappointed. This product leaves the skin glowing, feeling really hydrated and in a genuinely good condition. It's great as a makeup base as it really brightens the skin, however if you do have particularly oily skin then I would just apply it to the high points of your face where you would normally highlight. It's a pink/pearl white finish and it's a really creamy consistency. Kiko's Glowing Potion Perfecting Serum is a bit more of a mouthful but it honestly is practically the same! It's more of a silver/white finish and obviously from the name it is a bit thinner in consistency as it's a serum. I actually think this product has a much nicer scent to it, it smells quite floral where as the strobe cream just smells like product, if you get what I mean? This serum also leaves the skin feeling in a much better condition, it feels hydrated and it's glowing! I do love Mac's Strobe Cream and would definitely re-purchase it, however if you don't wish to spend as much I would 100% recommend this dupe! Kiko's Glowing Potion retails at £13.90 so it's quite a bit cheaper and is available here.